This is the 7th video in Phantom Dan’s 13 Days of Halloween Toy Reviews! Mattel’s Ghostbusters line appears to be winding down, and the final figure of 2012 comes in the form of Courtroom Battle Ray Stantz, complete with Tony Scholeri! Join me for an advanced look at this upcoming figure from Mattel! Courtroom Battle Ray will be available on http://www.MattyCollector.com on November 15th, 2012! 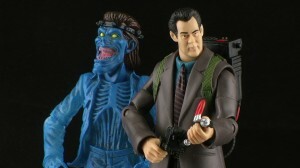 but NECA couldn't get Bill Murray's likeness, while Mattel could. And I don't believe they were planning on doing any ghosts from Ghostbusters II. The problem is Mattel ran the Ghostbusters line like they run the Masters of the Universe Classics line, and they expected the same results. They were hoping they could just swap bodies and heads with repaints, and pass them off as new characters. The problem is, as we all know, is that re-use of parts is expected in the Masters of the Universe Classics line and not tolerated in a Ghostbusters line. Mattel trying to cut costs is what killed this line. They use Vigo as proof that the line wasn’t doing well because of fan interest. But, the proof of the matter is, that fans has lost interest long before Vigo due to cheap figures and an uninspiring “road map” in order to produce low cost figures.